At first glance, you'd think it would be impossible for Christopher Nolan to top the billion-dollar box office phenomenon "The Dark Knight." Fans loved it. Critics loved it. And the late Heath Ledger earned nothing short of absolute cinematic immortality for his turn as The Joker. But he and star Christian Bale have given themselves one shot at outdoing their last go-round, wrapping up their planned trilogy with next summer's "The Dark Knight Rises." The stakes are high, not only for the franchise but for the characters that inhabit it, and the first full trailer reveals a story that is bigger on every possible level. This is going to be epic, but what exactly is going on? Funny you should ask. We scoured the trailer for clues, and here's what we came up with. The citizens of Gotham City come out to cheer on their hometown football team the Rogues. (Not "The Roues" - Captain G over there is just being lazy). Call us crazy, but does the "R" in "Rogues" look vaguely familiar? Maybe, you know….a little like THIS? Nah…couldn't be, could it? Of course, this could just be a winking in-joke. The first shot of the new villain, Bane (played by Tom Hardy). He's lurking presumably underneath the football stadium. He and his army have something big and nasty planned, no doubt. People who only know Bane from 1996's abysmal "Batman & Robin"will be shocked to learn that he's not a hulking moron. He's got the brains to be a mental and physical match for Batman. Here we are in Wayne Manor (rebuilt after being destroyed at the end of "Batman Begins"), but who is this man? It's tough to make out, but it looks like Bruce Wayne himself. Why is he using a cane? What exactly happened to him since last we saw him? A teary-eyed Alfred (Michael Caine) admits he has failed to "protect" Bruce. From what exactly? Whatever it is, it's enough to move the flinty Alfred to tears. The last time someone cried in a Batman movie, it was because the Joker had just blown up Rachel Dawes. Batman's police ally Jim Gordon (Gary Oldman) is seen leading a memorial service for the late Harvey Dent. Remember, at the end of "Dark Knight," Dent's fall to the dark side was covered up and Batman took the blame. Dent's legacy appears to still cast a shadow over Gotham. A couple of new characters. On the left is Brett Cullen, who is rumored to be playing a Gotham judge, and on the right is, yes, Matthew Modine, playing a cop named Nixon. Nolan is known for giving small roles to unusual actors (remember Anthony Michael Hall in "Dark Knight"? ), and these two appear to be conspiring against Gordon. Batman isn't the only one with nemeses. Our first look at Selina Kyle aka Catwoman (Anne Hathaway). She warns Bruce that a "storm" is coming, and that the wealthy of Gotham are going to be taken down. She seems kind of happy with this situation, too. The Bruce and Selina dance is a nice nod to Tim Burton's "Batman Returns." A bunch of cops trapped in subterranean tunnels - like the ones we just saw Bane skulking through. Is that what puts Gordon in the hospital (which we saw in the original "Dark Knight Rises" teaser trailer)? Selina may look like a high society girl, but she's (at least in the comics) a jewel thief first and foremost. Is she putting on the party dress in order to case Wayne Manor? Also note the cat ears dangling from the mirror. Nice. The aforementioned "storm" hitting Gotham's 1%. Nolan is all about tapping into the zeitgeist. Those legs belong to Bane, as he and his commandos lead a massive prison break. He is forming an army to take down the wealthy and corrupt Gotham City. In a nice echo to the beginning of "Batman Begins," we see Bruce (now a little grayer around the temples) bearded and in prison. Inside, he hears the mysterious chant repeated by Bane's followers, and is told it means "rise." Why is he locked up? And how does he fare once Bane and this men start busting out inmates? The Gotham Rogues are being played by actual members of the Pittsburgh Steelers (the sequence was filmed at Heinz Field), including wide receiver Hines Ward, seen here outrunning an explosion (triggered by Bane) that reduces the field behind him to a crater. We still think it would have been funnier to cast the Pittsburgh Penguins, but that's just us. 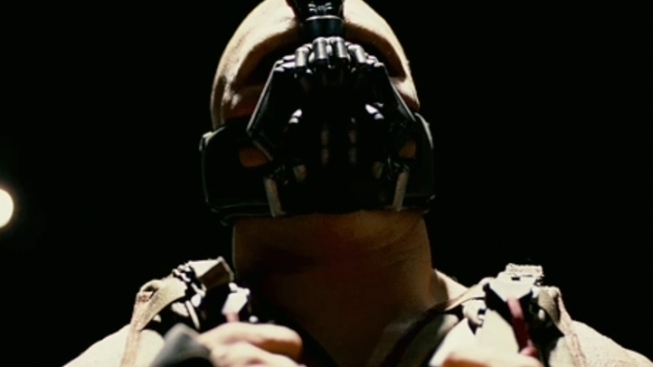 It may sound like Bane is saying "Mrrgmnle blargh mmmurgle bum schllzzzz" but he's actually saying, "When Gotham is ashes, you have my permission to die." What's significant is that he's saying this to an unmasked Bruce Wayne. Is Bane just targeting the wealthiest of wealthy Gotham, or has he discovered Batman's secret identity? Our first glimpse of Marion Cotillard, who is playing a character named Miranda Tate. Miranda is described as a "Wayne Industries board member," although rumors persist she may be Talia al Ghul - the daughter of "Batman Begins" villain Ra's al Ghul (played by Liam Neeson), who in comic book continuity has an affair with Bruce that results in a son named Damien (who is also trained by ninjas and eventually becomes Robin. True story). Oh, hey - Batman is in this, too! Here he stares down Bane on the steps of city hall. He quickly learns that going toe-to-toe with the monstrous baddie isn't the best strategy. …he, you know, has made some brand new modifications to his ride. Which he most certainly appears to have done. As far as trailer "money shots" go, this is pretty solid. it is ON. "The Dark Knight Rises" opens everywhere (and in IMAX) July 20, 2012. Which suddenly seems like an eternity away.